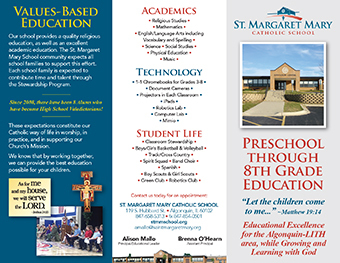 Saint Margaret Mary Catholic School admits students of any race, color, national, and ethnic origin to all the rights, privileges, programs, and activities generally accorded or made available to students at the school. It does not discriminate on the basis of race, color, national, or ethnic origin in administration of educational policies, admission policies, athletic or other school administered programs. School age children of families who are presently enrolled in our school, pre-school through eighth grade. School age children of families who already have siblings in our school, pre-school through eighth grade. School age children of school and/or parish staff members. School age children of registered parishioners who are already on a waiting list. School age children of registered parishioners not on a waiting list. 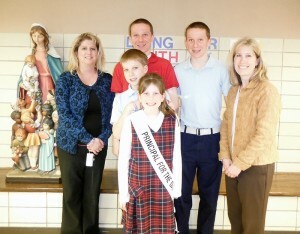 School age children of Catholic families who are registered parishioners in another parish. School age children of other faiths. In the event we have more in school families than spaces available, admission will be given to the children of the families with the most years of seniority in the school. After seniority, admission will be given to the family who registered first. This will be followed for any grade level where we have more children than spaces available.